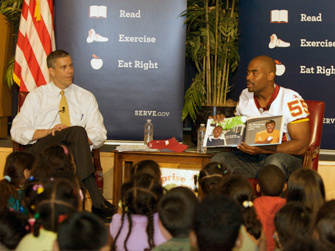 Washington, D.C.— Former Washington Redskin and education proponent Chris Draft will be in Washington. D.C. to host a series of events on Wednesday, July 20 to engage local students in an effort to combat childhood obesity and summer reading loss through the United We Serve’s Let’s Read. Let’s Move. summer initiative. A proven leader both on and off the field, Chris Draft’s philanthropic endeavors keep him busy throughout the year as he and his Foundation are actively involved in various community projects across the country. The Chris Draft Family Foundation seeks to make a lasting, positive impact on children, families, and communities. Using the inspiration and lessons learned while working with youth and families throughout his college and professional career, Chris Draft and the Chris Draft Family Foundation engage in community projects that support youth, families, schools, civic groups and health awareness organizations. Draft, in partnership with First Book, a nonprofit organization that connects book publishers and community organizations to provide access to new books for children in need, will provide books for all the attendees at each event. The Let's Read. Let's Move. initiative seeks to combat childhood obesity and summer reading loss by engaging youth in summer reading and physical activity, as well as by providing access to healthy, affordable food. The initiative is an Administration-wide effort led by the Corporation for National and Community Service in collaboration with First Lady Michelle Obama and five federal agencies - U.S. Department of Education, Department of Interior, Department of Health and Human Services, Department of Agriculture, and Institute of Museums and Libraries. Below is the schedule of events. All events are open press. WHAT:Chris Draft to visit Quantico Marine Base, reading with children of military families. WHAT: Draft to visit the Department of Education, reading with DC students and Secretary Arne Duncan, President Obama’s sister, Maya Soetoro-Ng, and Corporation for National and Community Service Acting CEO Robert Velasco. WHAT: Draft to visit Boys and Girls Club, engaging students in summer athletic activities. WHAT: Draft to visit YMCA to participate in “Family Fun Night”.